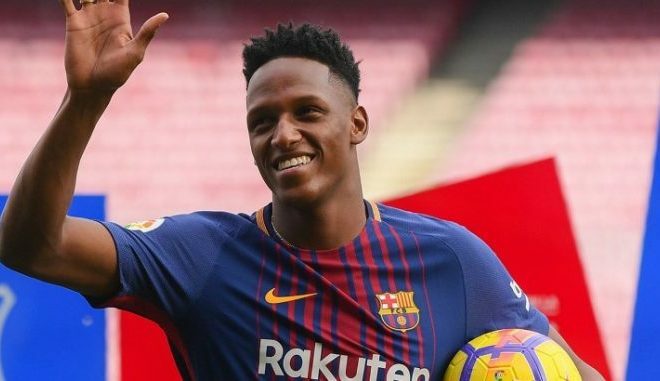 Following the speculations surrounding Yerry Mina’s move to Manchester United, news now have it that Manchester United are close to bringing him over to Old Trafford. Recent reports from Mundo Deportivo claims that Barcelona have already concluded to give the player out as they await an offer for the Columbian defender from the English Giants despite the fact that Everton and Lyon still have interest in signing him. After subsequent negotiations and deliberations, it is believed that the 23-year old’s fate would be decided today and hopefully, a deal gets signed. Mina’s agent and uncle Jair, is said to have all the papers ready and it is now left for the Red Devils to sign the deal after agreeing on the €40million asking price. The defender and United is said to have “practically agreed” to the terms of contract but the two clubs are yet to be in agreement. Meanwhile, United’s executive Matt Judge is already in Barcelona for Mina’s proposed move negotiations. Part of the deal United hopes to sign with Barca entails no buy out option which was possible if other clubs were to sign him. However, Mina likes the idea of a move to English side Manchester United as he made it known despite having offers from other clubs, and he could soon be on his way out of Nou Camp soonest after spending few months with the Spanish champions.